Alvinnn!!! and the Chipmunks - BN Licensing B.V.
Alvin and the Chipmunks, #1 family property in music, tv and movies for over 50 years! 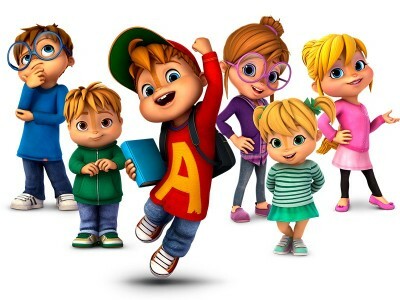 With 16 Gold & Platinum albums, more than 50 million records sold, 6 Grammy Awards and 18 Grammy nominations, Alvin and the Chipmunks are the absolute number 1 Kids Music Group of the last 50 years. Besides that, Alvin owned the most popular kids show on television in the 80’s, with over 50 million viewers in 150 countries. The show got 5 Emmy Award nominations. And now Alvin, The Mischievous troublemaker is back. Naughtier than ever! Simon is still the smart Kid, Theodore the sweet one and the Chippettes are cute as ever... In most episodes! Get ready for the roller-coaster of a lifetime in this all new, Glorious CGI Animated TV show. Alvin and The Chipmunks, The Chipettes and Characters TM & © 2018 Bagdasarian Productions LLC. All Rights Reserved.